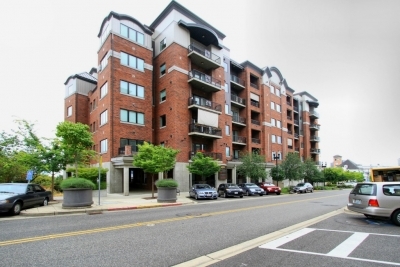 Spectacular high rise condo on 9th floor located in Tacoma’s downtown theater district surrounded by entertainment and restaurants. Secured entry with video door bell in each unit. Luxury finishing touches throughout, including vaulted ceilings with crown molding, carpet, tile & hardwood floors. Gourmet kitchen that includes granite counters, stainless steel appliances & wine fridge. Full bath has soaking tub, dual sinks and linen closet. Large master bedroom with huge walk in closet! Utility room with full size washer and dryer, sink & storage., Den that is cable ready ideal for home office. Balcony with gas hook up ready for your grill. Amenities include sky lounge with spectacular view of sound and mountain, work out gym, and hot tub. Guest suite available for out of town guests. Also includes a reserved space in secure garage with a storage locker.